NO PROSECUTION HISTORY ESTOPPEL. Patent was granted (after my written arguments against 1st OA) on the verbatim original claims made, with zero amendments. I never spoke nor negotiated with examiner on the claims. It's an apparatus which replaces the crankshaft in an internal combustion engine. Apart from (historically) allowing an engineer to virtually eliminate piston friction generated vibration (huge! 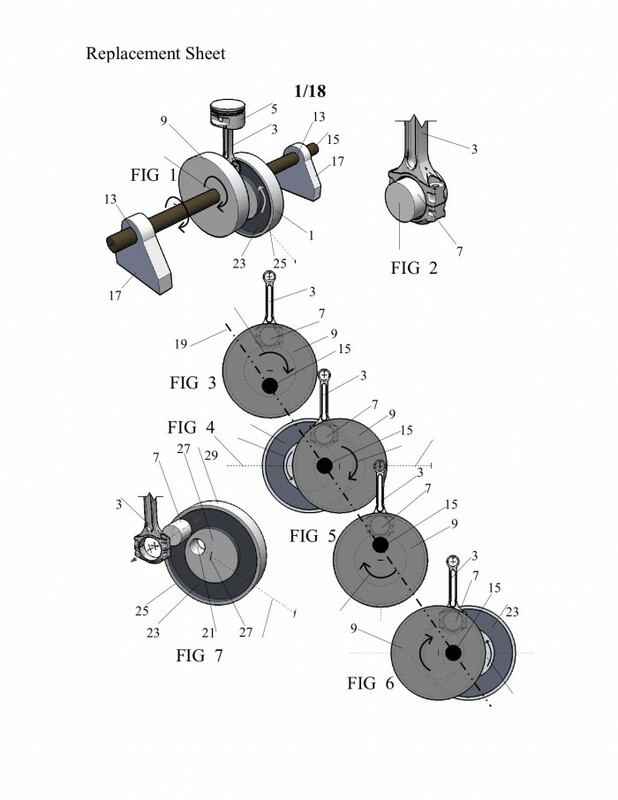 ), one may easily construct whatever piston displacement (along the stroke) he wants as a function of crank angle position, impossible with a crankshaft. Apparatus allows one to construct hyper-efficient engines, including HCCI, "constant volume combustion" Otto Cycle (4 stroke), and more as detailed in patent spec. Patentee went to courses by Prof Kayton, etc., to not needlessly get screwed by judges prone to reading spec' into the claims. Literal infringement is easily enforced, as upwards of 20 different embodiments are specified and drawn. There are NO "means + function" claims. With the many embodiment disclosures, the doctrine of equivalents is very strong. 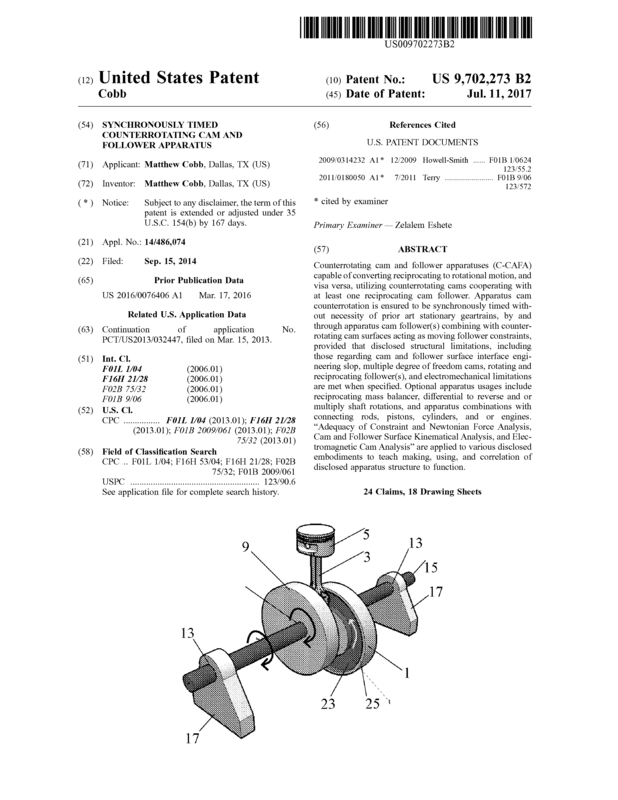 Despite roughly six prior art "counterrotating cam" apparatuses ostensibly resembling the Patent (all disclosed, discussed, and dis'ed), its claim limitations defeated all prior art. Apparatus allows one to make hyper-efficient engines which can be used, for example, as "range extenders" in electric vehicles to charge battery packs, etc. The Patent's upside is huge. The Patent was a continuation of a 2013 PCT international filing, whose UK National Patent is may be in play, but has otherwise been abandoned. US Priority date is March 15, 2012. Patent term is 21 years. The spec's / claims in all patent app's mentioned herein are virtually identical, and US PPA was utilized prior to PCT, then PCT was followed by US National phase. The Australian company, Revetec, has recently successfully marketed so called high torque internal combustion engines embodying a seemingly similar apparatus (counterrotating cams), but this apparatus was found to be, and is, far superior. Seek outright sale of patent, with buyer granting back non-assignable permanent license to patentee. Page created at 2019-04-21 17:03:28, Patent Auction Time.